Titans! (Like hitting things. Very very very hard. Led by Lance Reddick. Who has a character name but trust me it’s basically Space Lance Reddick). You choose one and off you go into the world to be amazed by the design work and disappointed by just how shallow the story is. Until! You get to Destiny 2 and the expansions for it which have actual characters! And arcs! And plot! 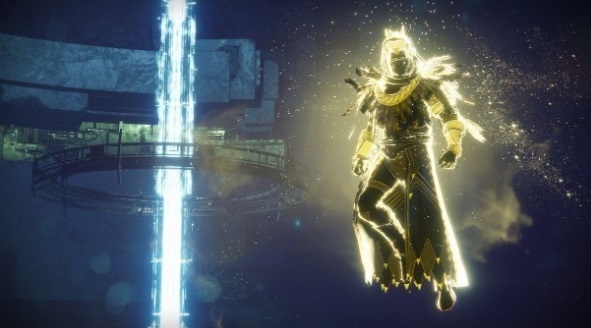 Curse of Osiris in particular is great fun and focuses on Osiris, a Warlock who was exiled from the City years previously. He’s wandered the Infinite Forest, a planet sized simulation engine (Which is the exact sort of glorious idea I play games for) and has found something very very bad. And he needs your help. Running around Mercury, where much of the story takes place is vastly enjoyable especially as Osiris is voiced by Oded Fehr and is just a magnificent Arse. It’s like watching a Doctor Who story from the point of view of a confused UNIT soldier; you often have to shoot things and there’s this arrogant prick in a stupid coat bouncing around yelling how he clever he is and how little time there is to explain. Which in the original game when every bloody NPC did it, was annoying. Here it’s weirdly charming. Plus Destiny 2 feels more grounded. Yes you (I) am still playing a human tank who can’t die permanently and turns into SUN!THOR! when sufficiently charged up. But the complacency of the City has been rocked to it’s core, the consequences of your actions actually exist and drive the plot and there IS an actual plot for them to drive. It feels a lot like playing a console version of Dune, adapted by the people who do the good Call of Duty games and that’s very much a compliment. Plus the next expansion apparently involves an AI, hidden on Mars, that communicates through classical music. CANNOT. WAIT. Destiny 2, Curse of Osiris and Warmind are all available now for PC, PS4 and XBox One. The third expansion, which looks set to do awful things to fan favourite Cayde-6, presumably so Nathan Fillion can go star in this surprisingly great Uncharted fanmovie is out later this year.